This article first appeared in The Edge Financial Daily, on December 5, 2018. KUALA LUMPUR: Beset with problems, the new team at Lembaga Tabung Haji has crafted a turnaround plan that is likely to involve a special purpose vehicle (SPV) taking over its underperforming assets at book value, sources say. The move will enable Tabung Haji to close the gap between its assets and liabilities. Tabung Haji is believed to now have around 80 sen in assets for every ringgit of liabilities. Section 22 of the Tabung Haji Act states that it cannot pay dividends and bonuses to its contributors if its assets are worth less than its liabilities or if it is not profitable. Yet, under its previous management, Tabung Haji continued paying dividends in the past few years. “To get Tabung Haji back on track, it needs to make the assets at least equal to the liabilities so it can pay dividends,” a source familiar with the matter told The Edge. The turnaround plan is expected to be unveiled soon. It is understood that the SPV will issue sukuk to raise the cash to acquire the underperforming assets from Tabung Haji. The SPV will then, over a period of years, work to recover the value of those assets. This is similar to what Danaharta Nasional Bhd did when it took over the non- perforning loans of banks after the 1997-1998 Asian financial crisis. It is learnt that the Tabung Haji turnaround plan includes separating the pilgrims management from the deposit-taking operations so that the latter can be supervised by Bank Negara Malaysia (BNM) which currently has no regulatory oversight of Tabung Haji. The plan comes amid growing signs that all is not well at the pilgrim fund. Sources also say that Tabung Haji inflated its profits in the last few years to justify paying dividends to contributors. Recall that in December 2015, BNM issued a letter warning Tabung Haji that it needed to strengthen its risk management after a routine check uncovered that it had more liabilities than assets. The then governor Tan Sri Dr Zeti Akhtar Aziz told then Tabung Haji chairman Datuk Seri Abdul Azeez Abdul Rahim that it had only 98 sen in assets for every ringgit of liabilities. In a separate letter to the then minister in the Prime Minister’s Department Datuk Seri Jamil Khir Baharom, Zeti warned that Tabung Haji’s finances could have a financial impact on the government because its deposits are fully guaranteed by the government. Zeti had expressed concern that Tabung Haji had been paying out higher dividends than it could afford since 2012. But because BNM has no regulatory authority over Tabung Haji, its warnings were ignored. Sources say Tabung Haji’s new management wants deposit taking to become a regulated business under BNM, much like banks. 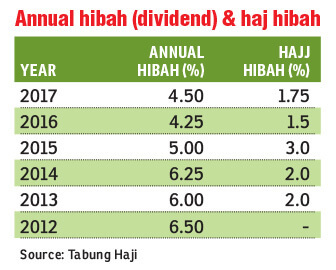 In February this year, Tabung Haji declared a hibah (dividend) of 4.25% to its depositors and an additional haj hibah of 1.5% to those yet to perform the haj, for financial year 2017 (FY17), just ahead of the May 9 general election. It has, however, yet to release its FY17 accounts. According to its website, Tabung Haji has more than nine million depositors and manages over RM73 billion of deposits. Tabung Haji has two main businesses — deposit taking and the haj operations. Tabung Haji’s new leaders came on board in July, with the appointment of two top corporate figures — former banker and Securities Commission Malaysia chairman Tan Sri Mohd Nor Yusof and former chief executive officer (CEO) of Bank Islam Malaysia Bhd Datuk Seri Zukri Samat — as chairman and CEO respectively. This was after the resignations of senior board members Abdul Azeez as chairman, Tan Sri Irwan Siregar Abdullah and Tan Sri Mohd Apandi Ali. Datuk Zaiton Mohd Hassan, an accountant and founding CEO of Malaysian Rating Corp, and retired attorney-general Tan Sri Abu Talib Othman also joined the board in October. It is understood that the new management and board of directors have been reviewing past transactions and investments to get a true picture of its financial affairs. Yesterday, the 2017 Auditor-General’s Report revealed that Tabung Haji failed to record an asset impairment of RM227.81 million in three subsidiary companies and three associate companies, especially its investment in associate company TH Heavy Engineering Bhd amounting to RM164.58 million. Last Friday, Tabung Haji lodged two police reports against former chairman Abdul Azeez, CEOs Tan Sri Ismee Ismail and Datuk Seri Johan Abdullah as well as four senior management staff — over misuse of funds and wrongful conduct in a corporate deal. In the first report, Tabung Haji alleged that RM22 million from Yayasan Tabung Haji’s 2017 programme was spent on activities with political inclinations, which contravened the memorandum and articles of association of the charitable entity. Tabung Haji had contributed RM7 million to the programme. Its trustees then were Abdul Azeez, Ismee, Johan, chief operating officer Datuk Adi Azuan and chief financial officer Datuk Rozaida Omar. In the second report, Tabung Haji alleged that Ismee, Hazlina Mohd Khalid (legal adviser) and Rifina Md Ariff (senior general manager of corporate services and real estate) misrepresented and withheld material information related to Tabung Haji’s sale of its 95% stake in PT TH Indo Plantations to PT Borneo Pacific for US$910 million.